You've strolled Paris's cobblestone streets; soaked up the sun (and imbibed your fair share of rosé) in Provence, but France – the world's most visited destination, welcoming more than 79.5 million international travelers in 2011 – isn't limited to just these popular destinations. As a resident of Paris, I've been lucky to explore hidden corners of the hexagon. I've found an incredible diversity of landscapes, culture, and even cuisine. Here are four of my favorite off-the-path places. Cap d'Ail: Cannes and Saint Tropez get most of the action on the Côte d'Azur with sun-worshipers crowding the beaches during the day, and trading couture swimsuits for designer threads to hit the nightclubs by night. But if you travel east along the French Riviera, you'll find a series of villages that have retained an air of authenticity because they're not on the main highway heading to Italy. Abutting Monaco, Cap d'Ail is one of these treasures. It's still glam (there's a Philippe Starck-designed restaurant on the water) – but it's not overrun. Tip: The local train that hugs the coast – connecting Nice with villages like Villefranche-sur-Mer and Cap d'Ail to the east – follows one of the most scenic routes in the world. I'd hop on just for the ride. The ticket from Nice to Cap d'Ail costs less than 3 euros, and the trip takes just 13 minutes. Nantes: Straddling the Loire estuary at the gateway to the Atlantic, the cool port city of Nantes has a killer location equidistant to sun-drenched beaches and Muscadet vineyards. At its doorstep is the magnificent Renaissance chateaux (like Chambord) in the Loire Valley. The city itself routinely gets props for being so "livable," and this year it was elected "Europe's Green Capital 2013" by the EU. Major renovation projects have transformed former industrial areas into cutting-edge art districts. 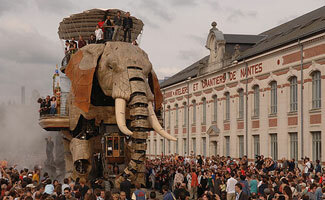 You'll even find a giant elephant, carrying 50 passengers at a time, cruising the streets of the Île de Nantes. The Machines d'Île is an original art project inspired by the whimsical imagination of Jules Verne, who was born in Nantes. Tip: Don't miss Le Lieu Unique, an old biscuit factory that now houses a restaurant, music venue, and hammam in the basement, and Le Nid, a bar designed by an artist as a bird's nest at the top of the Tour Bretagne (an office building). Le Toquet in Pas-de-Calais: Northern France isn't an obvious choice; it's often overlooked for its tourism attractions. After all, when you think of a beach getaway easily accessible from Paris, Deauville springs to mind. (The tony seaside resort, where Coco Chanel first set up shop selling hats, continues to draw well-heeled Parisians to the wide stretch of beaches, Barrière casino, and chic boutiques.) But Normandy isn't the only option for a weekend by the mer. In-the-know urbanites steal away to Le Toquet, the Prince of Wales's playground in the early 20th century. In the period between the wars, Le Toquet actually pulled in more casino gambling receipts than Monte Carlo and the French Riviera. Today this under-the-radar beach town offers lots of enticing activities – from horseback riding to le char à voile. ("Sand yachting" is a favorite locals' pastime: Fly across the beach in a three-wheeled buggy powered by a sail.) For luxe digs, Michelin-starred eats, and a spa by Nuxe, book a room at The Westminster. Tip: On your adventure north, consider stopping at the Louvre's new satellite museum in Lens. Bourgogne: In the famous Burgundy wine region, villages like Vosne-Romanée are mythic in the minds of oenophiles. The wines produced here in the Côte de Nuits, often called the Champs-Élysées of Burgundy, are coveted around the world. Further south in the Côte Chalonnaise, in tiny villages like Alluze, you can enjoy tastings directly with the wine-makers, like Alain and Isabelle Hasard of Domaine Les Champs de l'Abbaye, which only produces organic vintages. Tip: The nearby Caveau Divin Mercurey offers 64 different wines – and with the Enomatic system, you can taste everything by the glass. 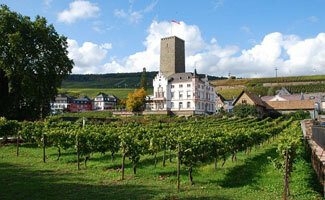 Have you been to any of these villages? Tell us which is your favorite!